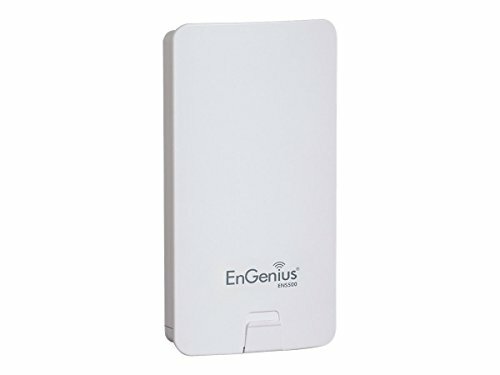 ENS500 is a high-speed, long-range outdoor 802.11n Wireless N300 Bridge that operates on the 5GHz band so it avoids the congested wireless traffic from devices on the more commonly used 2.4 GHz frequency band. This makes the ENS500 an ideal solution for building-to-building wireless bridging, for stable streaming of video from connected IP security cameras in parking lots or garages back to a company network, or for sending data to outdoor digital signage. The ENS500 is compliant with the IEEE802.11 a/n standard delivering a wireless data rate of up to 300Mbps. It features an internal directional 10 dBi MIMO (Multiple In/Multiple Out) antenna that coupled with its strong transmit power of up to 400mW makes the ENS500 a compelling performance solution for small and growing businesses at a very affordable price. The ENS500 can also be used in other operational modes including as an Access Point. When used as an Access Point it should be positioned in such a way, because of its more focused directional antenna signal array, to offer wireless network connectivity to a more defined outdoor venue rather than a more general outdoor area around it. If you have any questions about this product by EnGenius, contact us by completing and submitting the form below. If you are looking for a specif part number, please include it with your message.